There’s a light breeze gently swaying the trees as you awaken to your lake view in the morning. 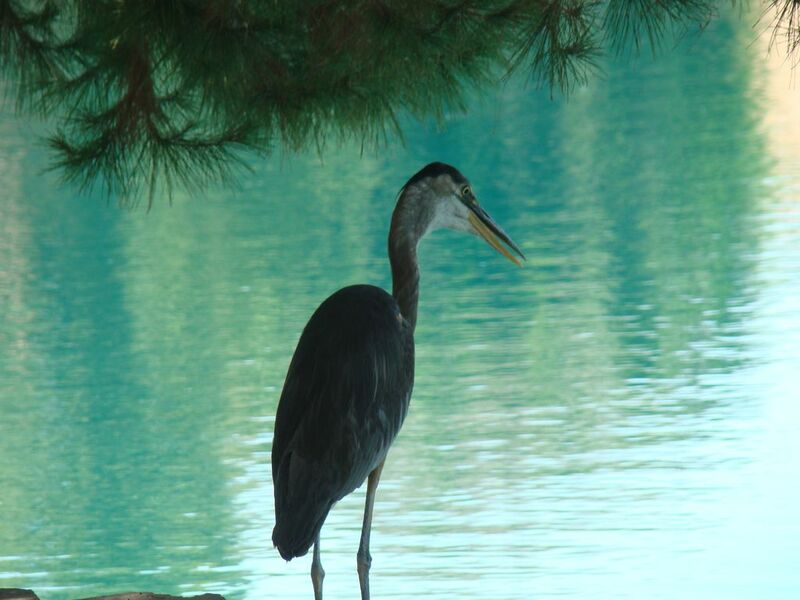 A humming bird buzzes by, a momma duck and her ducklings glide across the smooth water, a Great Blue Heron stops in to go fishing…and you can too, right from the backyard! Just a typical morning here at StoneBridge Lakes! This 2400 square foot waterfront home features four bedrooms, two baths, a fully equipped chef’s kitchen facing the lake, informal dining with a lake view, a separate formal dining area and living room. It has a romantic Great Room, adjacent to the kitchen, with a river rock fireplace, a lake view, a 60” HDTV with Dish Network, Pioneer surround sound and access to endless music of your choosing through the Sonos controller connected to Napster (a library of over 2 million albums so you can choose whatever you are in the mood for)or if you would rather have a play list rolling for you, use the free Pandora Radio! Bedroom Configurations: The master bedroom is truly a sanctuary, with a very comfortable, brand new Tuft & Needle "The Mint", memory-foam queen sleigh bed flanked with matching nightstands and an armoire. There is also a suede chaise lounge that faces the lake, so you can relax or read while enjoying the beauty and calm of the lake. If you want to lounge watching TV, there is a 40” flat screen HDTV or you can listen to stereo. To complete the master suite, is the master bathroom with separate tub and shower both with a lake view so you can keep watching the wildlife outside. The large walk-in closet is right in the master bathroom for an easy transition! The primary guest bedroom also features a queen size bed with comfortable memory foam pillow-top mattress and a 30" flat screen TV. Just across the hall, is a bedroom that has been configured as a gym and mini-office. The front bedroom, near the entry of the home is configured as a formal office, with a computer with Internet access, color printer/copier & a library and a rich leather day bed which can sleep two. If you are hosting short term visitors, the living room couch has a fold-out bed. We keep a feather bed on hand, so you can make this super comfy for your guest. The kitchen features new appliances, upgraded 2018. Washer / Dryer were upgraded 2019. All new 4k TV's in the livingroom and master bedroom. Outdoors & Extras: You will find yourself spending a lot of time in the back yard. Enjoy sitting out under fans, lounge chairs, or cook up some bar-b-que, all while enjoying your lake view and the various birds that fly through for a visit! You are walking distance to Old Town Gilbert where all the great restaurants and bars are. The place is hopping! Minutes away from San Tan Mall, world class golfing, spas and all sorts of great Arizona action if that's what you seek. High-speed WIFI is provided for your stay. Most of our guests tell us they rarely want to leave the house! You will feel like you are on vacation at a resort when staying at this waterfront home that previous guests have dubbed “The Magnet” since they never want to leave and always want to return! The Master Bathroom is part of the full luxury master suite. You will love the beautiful slate stone flooring. Newly updated counter height rich, cherry-wood cabinets. The toilet is in a separate 'water closet' as the English would say; and has new comfort height toilets. The Shower has a lake view; the fixture has multiple settings for massage and includes a removable wand. The separate large oval tub also faces the lake. When you are all clean, you can get dressed right there by going into the walk-in closet. The second bath also has a new Comfort Height toilet; beautiful slate flooring. The Shower/Tub/Toilet area can be closed off separate from the sinks. Driveway can support three vehicles; one car can use garage space. Formal living room as well as a Great Room off of the kitchen. Stream music from popular services included with your stay through Sonos system for whole house music. This home is really set up to be your second home. This is a single story floor plan and perfect for that winter stay in the warm Arizona climate. You will want to come back every year! A mix of beautiful slate stone, hardwood and carpeted flooring give a cozy, warm feel. A well equipped kitchen has more than you will find in a typical vacation rental. It is in a great location, near a local museum, the Hale theatre, golf, restaurants and shopping. A short drive away from major sporting venues where you can see the Diamond Backs, the Phoenix Suns or the Cardinals depending on the season. If the outdoors is your thing - you are 30 minutes away from beautiful lakes, 2 hours from Sedona, the Grand Canyon and other great Arizona outdoor activities. Quiet, on water..rest or explore Arizona. Wisconsin Grandparents wintering in Arizona to be near daughter and family who reside in Gilbert found everything we expected and more. A lot of people would shy away from Arizona in the summer, thinking it will be way too hot! And, well - it is definitely hot! However, it is also monsoon season, so you get the treat of experiencing desert thunderstorms, complete with the lightening bolt show and loud clap followed by rolling thunder! Truly an awesome experience! You can sit outside under the solid awning, so you are fully protected and it is warm enough. The lakes are great, so if you like boating or tubing - even early morning golf, it's not a bad time to visit. The home itself is exquisite - beautifully appointed. Know that one of the bedrooms is configured as an indoor gym, and it also has a workable office that is equipped with a windows PC ans all-in-one printer. This is a great workspace! There is a leather trundle bed I there, so if you had to, you could accommodate a couple of extra guests. Great place, will definitely come back. I loved this place the minute I walked in. The decor is wonderful, the house and environment is relaxing, it's close to everything. The water view is amazing, I will come back on my next vacation to AZ! We rented this home for a two weeks to commemorate my father's 70th birthday in May 2009. It had room enough for six of us to stay comfortably. We decided on this place in Gilbert, Arizona because it was close enough to the happenings, but secluded enough that we could really feel like we were away from it all. The master bedroom/bathroom suite is to die for with views of the lake everywhere. All the rooms are really nice; linens are fresh, beds are amazingly comfortable. Everything about this house is wonderful - the slate flooring is just gorgeous and cool. I want to buy it! We spent most of our time outside in the perfect May weather -- not to hot, not too cold! The backyard has lush green grass, flanked by pine trees - great for when we played Bocce Ball that the owner has for outdoor fun. My brother-in-law loves to fish, so he taught us all how to "catch & release" fish right from the backyard! What fun and so many good laughs were had! We often sat out in the back yard or lounging and enjoying the hammock. The BBQ is underneath a light and a fan, so it's really comfortable to cook no matter the time of day or evening. We also made use of the kitchen, which frankly is better equipped than my own home! The formal dining room has this great, long distressed wood dining table with very comfortable leather chairs. We had great dinners, played cards, dominos and all sorts of family games. I should mention that the sunrise and sunsets are beautiful -- especially if you are lucky enough to have a little storm go through. We saw an amazing sunset, followed by a night-light show from the Thunderheads. All-in-all, we could not recommend this home more! We will be coming back!! Cory thanks for posting your memories of your stay (your first stay!!) at "The Magnet" as we now call it. If you have the time, it would be great to hear about that next stay you all did over the Thanksgiving holiday. Don't forget, I offer my repeat customers a discount! Come on back! I must say I have rented vacation homes in various cities but this home is truly a magnet to ones heart. It sits on a lake and when outside sipping a glass of wine and reading a good book you feel such serenity and peace, we spent much time outside enjoying this view of the water, BBQ and the hot tub. The kitchen is a cooks dream, clean and has all the toys a top chef would want at their disposal. The beds were comfy and all and all it was a very quiet place to reside with my family. If you do choose to leave this home for a night out there are many nice restaurants near by. I highly recommend this vacation home to anyone that can appreciated the comforts of home with the beauty of sitting on a lake.. it is truly a great find and the owner is very easy to work with. Pamela - Thank you for taking time to write such a wonderful review! You and your family were so great to work with and were the first guests we had when we put it into rental years ago. We hope to see you again soon! is also near, with the Hale Theatre, a museum and lots of new great restaurants have opened as well as some older local favorites like Liberty Market, the Farmhouse and Joe's BBQ. A number of new restaurants have also popped up - JoyRide is a new favorite right next to Postino's. Joyride is a new hipster style mexican restaurant - great food and unique drinks.